The used plastic to oil pyrolysis plant from Henan Doing Mechanical Equipment Co., Ltd is a green technology for waste plastic recycling. The used plastic to oil pyrolysis plant is well received by our customers home and abroad. Till now, our plastic to oil pyrolysis plant has been exported to more than 30 countries, such as Italy, Macedonia, Egypt, Jordan, Nigeria, Malaysia, Thailand, Mexico, Haiti, etc. Used plastic to oil pyrolysis plant can change scrap plastics into fuel oil environmentally friendly. Thus greatly help to solve the scrap plastic disposal problem. 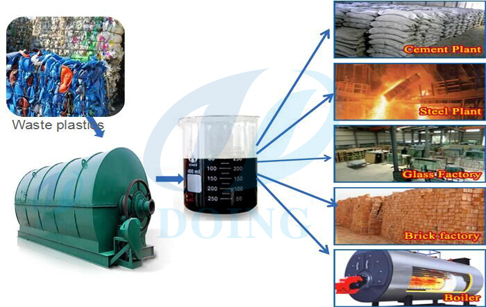 Our used plastic to oil pyrolysis plant has the following features.